Flight 6780 originated at Buffalo, New York, for Newark, New Jersey, with stops scheduled at Rochester, New York, and Syracuse, New York. The first two legs of the flight were uneventful. At 14:01 the airplane departed Syracuse and climbed to the assigned cruising altitude of 7000 feet. The flight reported over Paterson, New Jersey at 15:21 at 7,000 feet and was cleared to descend. At 15:39, at an altitude of 1500 feet, the flight was told it could start its approach inbound from Linden. The flight reported leaving Linden inbound at 1541, and was instructed to listen to advisories from Ground Control Approach on the frequency of the localizer voice transmission and cleared to land on runway 06. At five miles out the flight was 900 feet left off course, but the Newark radar controller guided the crew for the approach. At three and a half miles out the plane drifted to the right until it was 900 feet off course. The airplane continued off course and descended until it crashed and burned at the approximate corner of the intersection of Williamson and South Streets in Elizabeth, New Jersey. This position is about 2,100 feet to the right (southeast) of the glide path and about 3-3/8 miles from the touch-down point on runway 06. A storm-buffeted airliner plunged thru fog and rain into a frame apartment house, killing former War Secretary Robert P. Patterson and at least 27 others. All 23 aboard the Newark-bound American Airliner, including Patterson, perished. Four others died in their homes when the silver Convair crashed into the small apartment house and set fire to two other dwellings, bringing the death toll to 28. Police Capt. Nicholas Migliore said he expected the toll would go higher. Three of the resident casualties were children. Their bodies were recovered tonight from the charred ruins. The mother of two of them was the 27th victim. Eleven persons -- some residents and others rescue workers -- were hospitalized. Three were reported in poor condition. 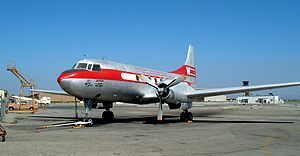 American Airlines Flight 6780 was the first fatal crash of a Convair 240 on January 22, 1952 at Elizabeth, New Jersey. The twin-propeller aircraft was on the routing Buffalo-Rochester-Syracuse-Newark. On final approach to runway 6 at Newark Airport using the instrument landing system, it crashed at 3:45 p.m. into a house at the intersection of Williamson and South Streets, in the city of Elizabeth, New Jersey approximately 3.4 miles (5.5 km) southeast of Newark. The cause of the crash was never determined. The plane, which had gone 2,100 feet (640 m) off course to the right, narrowly missed hitting the Battin High School for girls, which had dismissed for the day only 45 minutes before.